The Golden Knights moved up one round in the 2019 Draft essentially giving away Brad Hunt for next to nothing. The move has much more impact on the roster than next to nothing though. First, the trade opens a roster space for the time being. 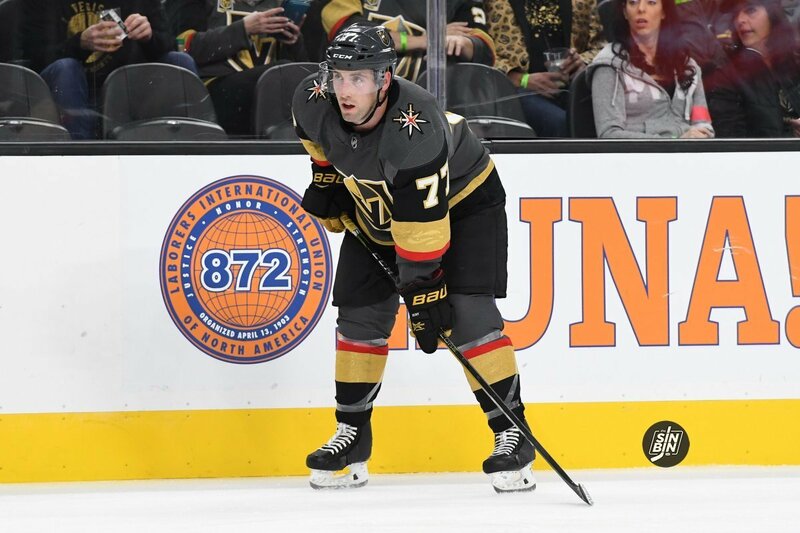 With Reilly Smith and William Carrier on IR and the Golden Knights roster at the limit of 23, the move of Hunt brings that number down to 22. Thus, when either Smith (maybe as soon as Wednesday) or Carrier are ready to return, no other corresponding move will be necessary. When the other one is ready to return, another move will be needed. Second, this trade appears to further cement Valentin Zykov on the Golden Knights roster. Zykov has played in just one game and it was in an “emergency” situation as the Golden Knights literally did not have any other forwards available. Zykov was picked up for a reason and odds are the Golden Knights are probably not going to give up on him having seen just one game and a handful of practices. After Wednesday’s game, which Zykov will probably not play in, the Golden Knights are off for almost two weeks. Smith is almost assuredly going to be ready on February 1st and Carrier who has been out with an illness will likely be back as well. Therefore, the final roster decision will likely be made before Zykov plays again. Gallant said there was “no pressure” to use Zykov before the bye week and went on to say, “he’ll get his chance eventually.” There’s quite a bit of reading between the lines going on, but it would certainly be a bit of a surprise to me if Zykov is the one to go when the bye ends. Finally, the Golden Knights now only have seven defensemen on the roster. Historically, meaning through more than 130 regular season games, they prefer to carry eight. So, the obvious first thought (at least to anyone who reads this website) would be Erik Brannstrom. It’s certainly possible down the road, but with the roster clutter remaining as is, it’s highly improbable he gets the call in the next few weeks. If there’s an injury, things could change though and there’s no question moving Hunt increases Brannstrom’s odds of seeing NHL ice this season. That being said, McPhee probably will eventually bring up another defenseman to fill that hole, even if it’s after the roster expands on February 25th. It might be Brannstrom, at least for nine games, or it might be Jake Bischoff, Nic Hague, or Zach Whitecloud. Or, there could be another trade in the works before the deadline. However, something will change on the blueline, even if it’s nothing major. So all in all, while it may seem like a fairly insignificant move, eventually something had to happen and McPhee at least turned it into something. Clearly, as the Wild were willing to make a trade to get him, Hunt would not have cleared waivers. From a hockey perspective, it’s always better to get something to move on from Hunt even if the return was peanuts. As for Hunt, this is a good situation for him as he should step right into the Wild lineup, at least while Matt Dumba is injured. He will be missed in Vegas much more for his personality than his hockey (and that’s not to say he’s bad at hockey). Brad was always the nicest, most positive, person in the locker room and in the community. Last year Steve Carp wrote a terrific article illustrating this point wonderfully. Is Jonathan Marchessault Out Of His Slump? “From a hockey perspective, it’s always better to get something to move on from Hunt even if the return was peanuts.” I think that is the point Jason has been trying to make on the last couple podcasts when discussing trying to make a trade for Carpenter or Lindberg instead of just putting them on waivers. Teams know the Knights are going to have to put someone on waivers. There may be teams willing to give SOMETHING, if not much, to get those players now instead of making a waiver claim. He’s a 1st round pick that has done nothing but impress at every level. He’s an incredible skater who has tremendous vision and is very good on the PP. He was good in a men’s league in Sweden as an 18 year old, he’s been tremendous as a 19 year old in the AHL and he was excellent in the World Junior’s. Oh, and he was good in the preseason in the NHL too. This kid is a stud, it’s a matter of when not if. He might or he might not. Everything he has shown in the AHL and world juniors looks like he has potential to be a really good player. We will never know how he is in the NHL until we give him a chance.